You've come to the right place – our Kars4Kids crew in North Carolina can pick up virtually any car donation, regardless of condition, and usually without a title too. Here’s what our North Carolina donors had to say about how donating went for them. Everything went well. Hope the car was a good help for the kids. It was a very simple process, and they followed through very quickly. I am happy to have provided to such a great cause. 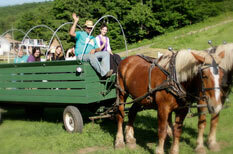 We invite our Kars4Kids families to celebrate the holidays together with us at our upstate New York resort with great food, fun activities for the children and lots of time for bonding. Because we're a family and that's what families do.Holiday cheer fills the air as volunteer mentors mingle with the members of our programs, creating a warm and positive atmosphere. The holiday season bring so many people feelings of joy. Unfortunately, there are still many children and their families who don‘t feel cared about enough to celebrate. That is where our annual holiday packages come in to play, with the sole purpose of uplifting the spirits of these families. Beautiful, colorful gift boxes are filled with gifts, treats and activities for the entire family to enjoy. 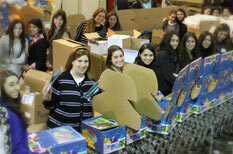 Kars4kids is a classified 501(c)(3) charity organization. You can check with your tax advisor or accountant to determine the amount of your benefit. The deduction is of value only if the donor itemizes his or her deductions. For a more detailed overview the IRS publishes a Donors Guide to Car Donation. We accept the following donations: car, snow plow, boat, bus, jet ski, truck, RV (motor home), commercial, airplane, van, trailer, motorcycle, ATV, tractor, and fleet donations. Sorry no kids. I want to donate a car in but I'm missing my title. Is my car still eligible for donation? We can usually pick up a vehicle without a title in North Carolina . We just need the registered owner to sign some paperwork for us. 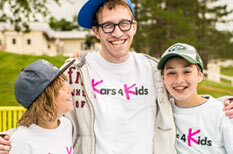 In almost all scenarios Kars4kids will apply for the new title for you. We'll handle all the paperwork and pay the title fees too. Download a complete an Application for Duplicate Title (MVR-4). The application should be notorized. Applications should be delivered to your local DMV or mailed to: NCDMV, 3148 Mail Service Center, Raleigh, NC 27699. Where do I sign my North Carolina title? 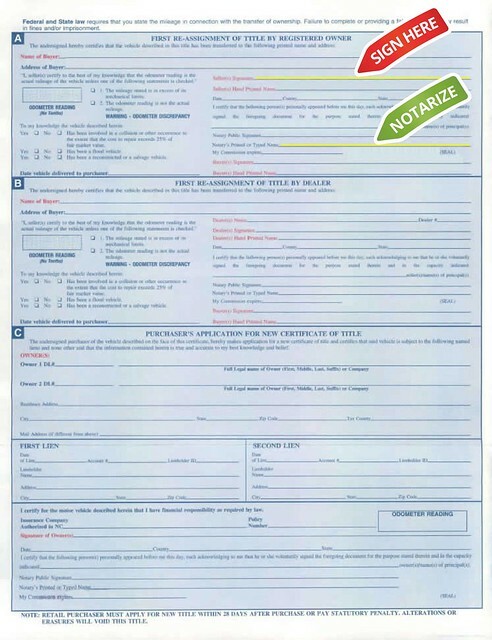 You will need to sign and have the title notarized in the presence of a notary public. The sample title document to the left of this paragraph has a blue arrow. Sign where the arrow appears using the name listed on the front page of your car title document. The title document should be given to the tow truck driver at the time your car is collected. Remove the license plates from the car, prior to it being towed. You may transfer your plates to a new vehicle. If you will not be transferring the plates they should be surrendered at your local DMV. Once the plate is turned in then the registration is canceled in the donors name . Cancel your insurance coverage on the donated vehicle once it’s been picked up. One car got around so much within the state of North Carolina, it ended up getting donated to us twice from within the same state! The first time around, it was donated by Clinton P. of Charlotte, the second time by Danny B. of Denver, NC. Any information on this page related to state laws and title requirements is correct to the best of our knowledge. But because this kind of information is liable to change, please check with your local motor vehicle authority for current guidelines and requirements.